The Delphi MK VI is Oracle Audio's flagship product ! The Oracle Delphi is not Stereophile's 2010 product of the year ... but the MK VI received the most first-place votes among the 8 other contenders in the record player category ... THE MOST FIRST-PLACE VOTES !!! ... how do you define winners ?? See and hear for yourself ... the Oracle Delphi MK VI ... a truly outstanding and unique sculpture designed for those who expect more from a record player ! 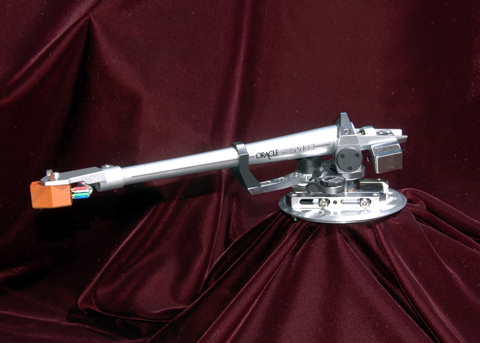 The Delphi subchassis / platter / tonearm assembly is suspended by a tripedal mounting, which eliminates room vibrations. Each suspension tower assembly combines 12 different components, using 7 different mechanical filters, all working as a whole to efficiently control unwanted vibrations. The traditional two bearing system has been replaced by a new system using six precision surfaced nylon screws. With this, Oracle reaches the highest level of rotational accuracy. Oracle selected a specially designed AC synchronous motor. The Delphi MK VI features a dual current drive circuitry. This provides maximum start-up torque energy and minimum efficient operational energy, which guarantees lowest possible motor vibration. The molded belt plays an important role in maintaining maximum speed stability. The maximum rigidity of the 4kg (8.8 pound) platter is immune to vibration by distributing most of the mass around it's outer edge. The flywheel effect increases momentum. Record coupling system (standard): Oracle pioneered the now well established "record clamp system" to solve specific vinyl disc "warp" problems. The Oracle acrylic mat made from specially formulated polymer shows better matching characteristics (impedance) with the vinyl disc. Oracle demonstrates that superior engineering can also be aesthetic. The hand brushed aluminum with a clear laquer coated skeletal subchassis will dissipate unwanted energy through efficient coupling and clamping methods. Maximum rigidity, minimal surface area and energy control are key design. The standard plinth is Clear Acrylic. An optional Black Granite plinth is available for an extra charge. The Delphi MK VI comes standard with a regular power supply. The optional MK VI Turbo Power Supply is the result of an extensive development and performance comparisons between reference elements such as special batteries and monstrous power source. The Oracle Turbo Power supply outperformed them all! The turbo power source transforms an outstanding performance into a wonderful musical experience. Both power supplies ship with a removable power cord. 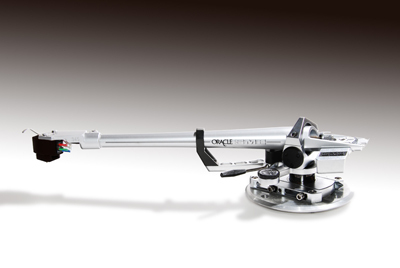 The Oracle/SME tonearm provides superbly detailed and transparent sound, making the music seem more alive and open. 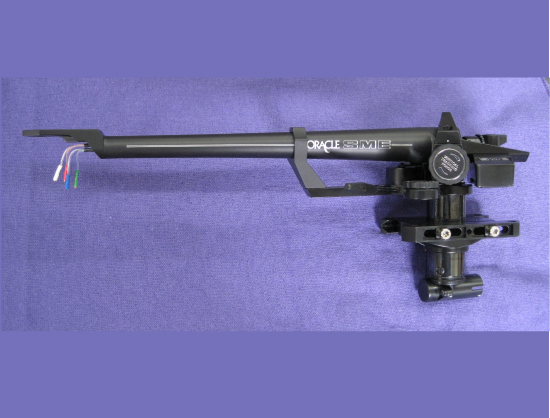 This tonearm offers differing pivot to stylus distances and was designed for the needs of a broader market requiring alternative arm length and interchangeable shell facility. The internal wiring of the tone arm is upgraded to Van den Hul MCS150 silver litz. A sophisticated high performance "Turbo" power line conditioner supply is available, as an extra-cost option. The Paris turntable ... from top to bottom. The only thing from the Paris that is similar to what we have done in the past is its design signature, everything else is a total redesign resulting from our studies that lead to the development of the best turntable in the world ... the Oracle Delphi Mk VI. The coupling disc is machined in two separate pieces of Delrin which is a crystalline plastic that offers an excellent balance of properties that bridge the gap between metals and plastics. The dish is independent of the tightening knob to prevent any damage to the record labels. The Delrin is a very efficient mechanical filter preventing the transfer of noise generated by the rotation of the spindle of the platter in its support. Although very minimal because of the built quality of the spindle holder system of the Paris, this rotational noise is always there ... and we are tracking it and minimizing it very seriously! The platter is also machined in two parts. The under platter made of aluminum is the hub where the drive belt will make the platter rotate with extreme accuracy. 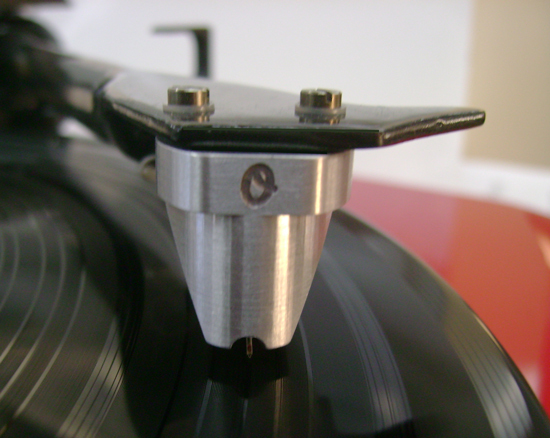 The upper platter is made of acrylic, this material is very inert, it does not allow any amplification of resonances, due to the stylus/record groove interaction, which could negatively and adversely influence the quality and the accuracy of the signal retrieved by the stylus which is stored in the record groove. Acrylic is also a very efficient mechanical filter. The spindle holder which supports the platter spindle uses two high precision bushings made of PEEK which is a high temperature resistant engineered thermoplastic with excellent chemical and fatigue resistance plus thermal stability. The tip of the spindle rests on a thrust plate which is made of the same high performance plastic material we make the bushings with. This is the same material used for the Delphi MK VI. This high performance assembly provides a smooth spindle rotation resulting in an improved signal to noise ration. The impact on the music reproduction is outstanding. You will hear more and cleaner inner details. The platter spindle is a high precision piece, made of stainless steel. The platter and tone arm are mounted on a semi floating chassis. The main frame and the semi floating chassis of the Paris are made of high density wood fiber. This material is very inert because of the nature of its variable inner density which makes it a very efficient mechanical filter. For improved performance and rigidity the main frame and semi floating chassis are laminated in 3 layers The Oracle mechanical design concepts are always intimately linked to the overlapping of different materials interacting within a same assembly. The Paris is no different! Compared with the Delphi MK VI which has a full floating system with a very sophisticated spring suspension system and micro vibrations stabiliser system, the Paris suspension system is very efficient while being much simpler. It has been completely redesigned taking into account the findings that led to the development of the MK VI. The heart of the MK VI is its ability to control micro vibrations. The Paris uses fibreglass rods and Sorbothane to achieve this complex task. The combination of these materials contributes to virtually eliminate the access of unwanted vibrations to the semi floating chassis where the platter, the tone arm and the phono cartridge are interacting. This is extremely important to optimize the environment thus allowing the stylus to retrieve the best possible information from the record groove. 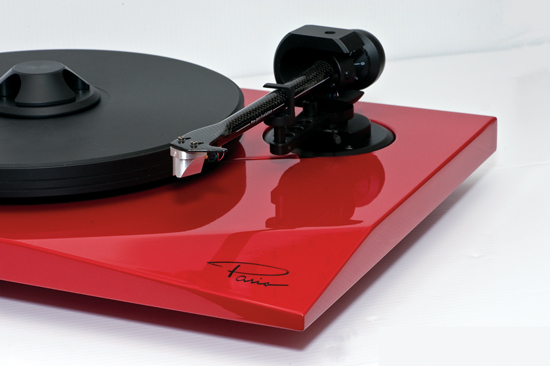 The Paris is a belt driven turntable. The motor which is a low voltage AC synchronous, the drive belt and the drive electronics of Paris are the same used for the Delphi MK VI. The drive electronics of the Paris has a very high precision oscillator circuit which creates a perfect sine wave signal to feed the motor thus ensuring high rotational accuracy for optimal speed stability. This system also isolates the drive electronics from line voltages impurities and fluctuations. The power adaptor of the Paris is 24volts DC. Again adhering to the mechanical filtering concept, the adjustable feet are made of Delrin. The convex shapes of the 3 feet procure a minimal contact surface with its supporting shelf. This also contributes to minimize the access of unwanted energy through the turntable system. The Paris turntable can accept a number of different tone arms. We offer plain or pre drilled tone arm boards to make this task easy. 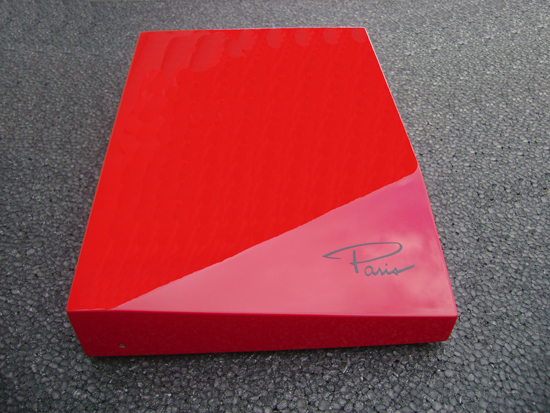 The Paris can also be fitted with a clear acrylic dust cover which is sold as an option. We developed the Paris so it can evolve in performance. The drive electronics architecture of Paris being what it is you can up grade your Paris turntable with the plug and play Turbo AC adaptor developed for the Oracle Delphi! The Paris phono cartridge has been designed to perfectly match the performance of our Paris turntable.